These KPIs should be included in almost every business plan, and VCs will expect to see forecasts and analysis on the topic. Performing LTV:CAC analysis correctly will improve analytical capability, empower founders, impress investors, and lead to more meaningful conversations. Customer acquisition cost (CAC) in its most basic sense is calculated by summing sales and marketing expenses in a given period and dividing those by the total new users added in that period. CAC can take several forms depending on the specific business model (e.g., TAC for Google and SAC for Netflix). Defining the expense portion of CAC can be challenging. The broadest possible definition of acquisition cost is a useful metric to track, but it should be complemented with more granular figures for specific campaigns and user types. LTR allows businesses to quantify the monetary worth of the average user on their platform. This is important for calculating return on marketing investment, and it also helps determine optimal capital outlays per user. In many cases, revenue simply cannot be generated without incurring some directly associated expense, so LTV provides deeper insight on per-user profitability. LTV also requires average customer lifetime to be estimated or measured. Many sources indicate that lifetime is a function of customer churn rate. The oft-cited formula for average lifetime is lifetime = 1 / churn rate. My work with startup founders has introduced me to dozens of truly brilliant and creative professionals, so I was initially shocked by the amount of education they required around investor pitches and important key performance indicators (KPIs) to include in their financial plans. Even the relatively informed or financially inclined clients struggled to craft informative and compelling narratives that demonstrated mastery over the nuance in forecasting. Unit economics, notably customer acquisition cost (CAC) and lifetime value (LTV), are among the chief metrics that endure investor scrutiny. Simply plugging numbers into the equations yielded by Google searches is often inadequate, and this could spell disaster when the financial model is presented and challenged. A recent article published on the subject runs through some of the dangers of using the metrics incorrectly. For this reason, I think that founders and prospective founders will find immediate value in a tutorial around the calculation and methodology of KPI forecasting. The management teams of any business with a marketing budget should forecast and measure the cost of acquiring each user. This metric is especially important among startups that create mobile apps, SaaS, or consumer-facing websites. Without that information, it is nearly impossible to measure the efficacy of marketing strategies, forecast user scaling, and plan capital raises for growth. Customer acquisition cost (CAC) in its most basic sense is calculated by summing sales and marketing expenses in a given period and dividing those by the total new users added in that period. A simple web search can bring anyone up to that level, but a more powerful model will tailor the metric to the practical realities of the specific business in question. The various elements of the above equation should be carefully defined because CAC can take several forms depending on the specific business model. Websites such as Google report traffic acquisition cost (TAC), whereas Netflix tracks subscriber acquisition cost (SAC). For mobile apps, a converted user could be defined by installs, subscribers, or even in-app purchases. The relevance of each definition is determined by the monetization strategy. While there are subtle yet important distinctions between these metrics, they all measure how much the company must pay to bring a new user onto the platform. Founders should dedicate time to selecting the definition of “customer” that will create the most informative value. Even after customers are defined, it is not always clear which expenses and user additions should be included in the formulas. User growth is typically derived from two main sources: sales or marketing activities and word-of-mouth from existing users. Marketing expenses do not directly drive word-of-mouth growth, so many modelers are hesitant to include these in CAC. However, viral growth is a function of paid growth in most circumstances, because new users should drive their own word-of-mouth adds. For these purposes, I find it prudent to embrace nuance, and I generally recommend that multiple CAC figures be tracked. If CAC is calculated specifically for marketing-driven users, it sheds light on the efficacy of the marketing campaign. This can be especially useful for understanding what will happen as organic growth rates eventually drop and the user base climbs. However, a blended version of the KPI that captures all new users is a useful complement to analyze the overall operations. Challenges are also present when defining the expense portion of CAC. The simplest and broadest methodology includes all sales and marketing expenses. However, expenses in these categories can often take the form of brand building rather than traffic creation. It may be the case that there are very different classes of users with widely disparate LTV on the platform. Again, the best solution is to embrace nuance. The broadest possible definition of acquisition cost is a useful metric to track, but it should be complemented with granular figures that provide specific insights to specific user-focused marketing campaigns and different user types. Lifetime revenue (LTR) is another essential KPI for many businesses. LTR allows businesses to quantify the monetary worth of the average user on their platform. This is important for calculating return on marketing investment, and it also helps determine optimal capital outlays per user. LTR is calculated by multiplying average customer lifetime by average customer revenue. Lifetime value (LTV) is similar to LTR, in that it measures the value of each platform user. LTV is calculated by subtracting direct expenses from LTR, often by multiplying LTR by gross margin. In many cases, revenue simply cannot be generated without incurring some directly associated expense, so LTV provides deeper insight into per-user profitability. As is the case with CAC, LTR and LTV may require nuance to generate the most powerful analysis. Businesses with multiple monetization strategies should consider teasing out separate LTR for each segment in addition to a blended overall figure. If there are multiple pricing structures (e.g., freemium or SMB/enterprise), it should be informative to track LTV for each group. Consider a mobile app that has free features, in-app purchases and also generates revenue from a premium subscription. If blended LTR rises or falls, management should know why. 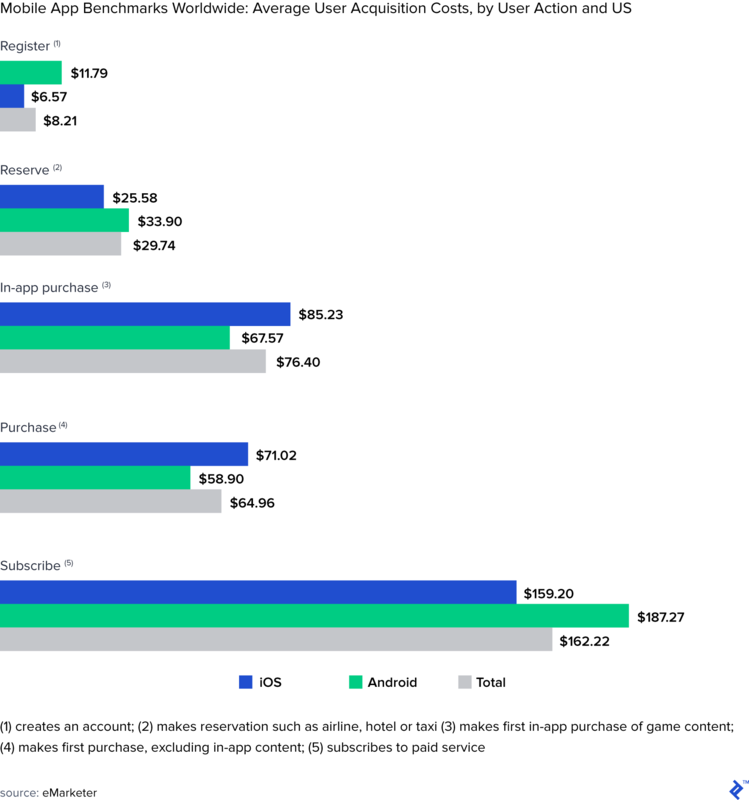 It could be attributed to premium subscriber rate shifting, in-app purchase behavior changing, or alteration of subscription pricing mix. Each scenario has different implications for performance evaluation and future strategies. LTV also requires average customer lifetime to be estimated or measured. Many sources indicate that lifetime is a function of customer churn rate. The oft-cited formula for average lifetime is (lifetime = 1 / churn rate). A mobile app can analyze data for installs, uninstalls, and user sessions to determine the number of months for which an average user will actively engage the app. If there is a monthly fee to use the app’s service, this number is multiplied by the subscription fee to calculate LTR. Alternatively, this metric can track average in-app purchases in a given time period, or simply reflect one-time download fee revenue. That’s often an effective methodology, but it is an oversimplification in many circumstances. 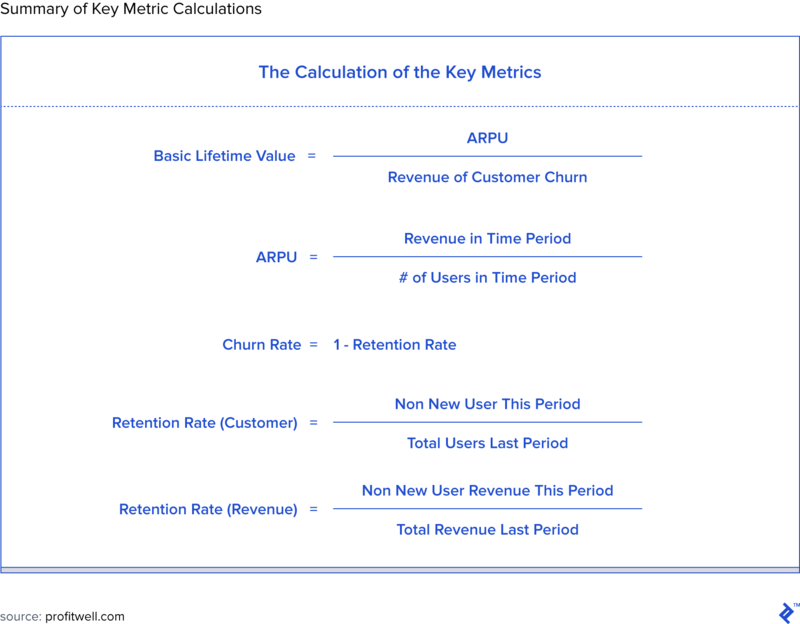 The above formula assumes that all users eventually churn, and it also assumes uniform churn rate across time. Neither of these assumptions is valid in many cases, which can have serious consequences for forecast accuracy. Churn rates tend to change over time as services improve, power users are added, “low-hanging fruit” is consumed, and competition emerges. Average lifetime also needs to account for users who leave your platform and return, so both new and returning customers should be tracked. Finally, some user lifetimes are best measured in units that are not time. For example, eCommerce platforms may measure customer lifetime in terms of total orders rather than months or years, especially if returning customers have long dormant periods between orders placed. Consider the case of a startup eCommerce marketplace that needs to attract both sellers and buyers. To bring sellers onto the platform, the company hired internal B2B sales reps to attend trade shows and network with potential vendor partners. This is a substantial, fixed, up-front expense, and CAC for sellers is high as a result. However, once a prospect is converted to a partner, these sellers tend to stay on the platform for a long time, and they can generate meaningful fee and service revenue. eCommerce customers, on the other hand, are much cheaper to acquire through outsourced digital marketing campaigns. Once they make a purchase on the platform, they have a much higher churn rate than sellers, leading to LTV that is comparatively minuscule. Overall blended CAC and LTV for this company would indicate if there were a unit economics problem, but it provides little insight regarding the source of a potential problem. Two separate figures must be developed and tracked to analyze the efficacy and viability of their sales and marketing outlays. Strong definitions lay the base for meaningful unit economics analysis, but the challenge remains to effectively interpret those metrics and present them powerfully to investors or company management. Founders and analysts, therefore, need to understand benchmarks from comparable peers, growth stage context, capital deployment goals, and alternative methodologies. CAC and LTV, when measured properly, can provide essential guidance for marketing strategy and capital deployment. There is not a universal target CAC, due to wide variation among industries and business models. The average cost per install in the United States for mobile apps is around $4, with installs on Android OS slightly lower than iOS. Premium subscribers are much more expensive, topping $160 each. Cost per install tends to be somewhat higher in entertainment, business, education, and shopping industries, whereas health, fitness, and productivity apps acquire users for less. Users in emerging economies are also cheaper on average than their counterparts in North America and Europe. Well-known subscription giants Netflix and Spotify paid $59 and $25 per new user, respectively, in 2017. Client acquisition can range much higher among enterprise SaaS customers, where each contract generally dwarfs those of B2C services. Similar principles apply to LTV. Average churn for mobile apps is about 60% after the first month, 70% after two months, and 75% after three months. These figures vary substantially by industry, monetization model, user incentives provided, and evolution of the products. Founders and managers should take care to ensure that churn rates do not drastically outstrip benchmark averages, but CAC and LTV must ultimately be compared relative to one another on an apples-to-apples basis. For the sake of credibility, founders are likely best served by presenting figures within the ranges demonstrated by similar marketing strategies with comparable companies. Forecasting results that substantially lag benchmarks indicate that you are actually planning to deliver sub-standard results. Overly bullish forecasts are likely to be dismissed, and investors will generally attribute this to unprepared or unrealistic founders. In the long term, LTV must exceed CAC to create a viable business. If that status is unattainable, then the company will never be able to internally finance product development, general and administrative overhead, or new marketing campaigns, and it will never create profits for owners. Founders cannot simply stop at verifying that LTV surpasses CAC, though. It is important to understand the time required for an average user to break even on acquisition cost. The target LTV:CAC ratio is often said to be 3:1. If the ratio is substantially higher than 3:1, then more aggressive marketing investments should yield superior growth without challenging the overall financial success of the company. If the ratio is too low, then the company is paying so much for each customer that they will struggle to invest in product development, build sufficient administrative infrastructure, and generate future growth. CAC, LTV, and the ratio of those figures generally change over time. This should be understood and embraced by management, but there needs to be a roadmap for KPI evolution and insight on the forces driving that dynamism. The 3:1 ratio is a useful waypoint for long-term planning, but there are certainly circumstances in which the target should be overlooked. LTV:CAC might be temporarily low (or even below 1) when a business invests heavily to create network effect moat or reach scale. As such, it is common for very early stage companies to fall well short of benchmarks. In some instances, the user base has not yet hit the scale to overcome large sales and marketing overhead in the form of employee compensation. It may also be very expensive to convert early users or customers before word-of-mouth organic growth begins to buoy the effects of marketing campaigns. Dynamic KPIs call for analysis of both spot performance and long-term trends. Unit economics analysts should consider the distinction between average and marginal figures, too. An entire marketing campaign can be evaluated with CAC and LTV across the length of that campaign, but those figures likely represent the average. With sufficient data to measure the cost of adding each new user at a given point in time, management teams will be better equipped to identify capital outlays that are improving financial performance as well as lags on returns. A sound medium-to-long-term plan must identify the circumstances in which the service becomes profitable on a per-user basis, but it is also often valid to prioritize growth over unit economic targets early on. Attitudes on this balance differ among founders and VC investors, founders should identify capital sources that share their philosophy. This can be achieved by studying funds’ investment portfolios and holding exploratory conversations. Founders can craft more compelling pitches and have more meaningful conversations if they put themselves on the same side of the table as VC. Startup investors are analyzing, among other things, the likelihood that their capital will deliver meaningful returns. Capital provided at early stages is generally deployed to build product or spur growth, so understanding marketing ROI is absolutely essential for founders who want to think like their investment partners. Investors are almost certainly viewing a portfolio member relative to the potential investment universe. What makes one investment opportunity superior to another? Venture capital analysts have to discount future cash flows from their investments to account for the time value of money because there is an opportunity cost of capital. This has major implications analysis of time-sensitive KPI, such as LTV. Churn rate benchmarks are useful for lifetime calculation, but they may obscure the impact of disparate user behaviors that determine the overall figure. In most cases, a core group of dedicated power users or clients bolster the average, making it higher by spending a long time on the platform, while a large group of less dedicated users drags down average lifetime with quick exits. This dynamic often resembles the Pareto principle, in which a small portion of clients drive a majority of revenue. The time required to recoup acquisition cost is therefore important to consider from an investment perspective. If LTV is spread across numerous years, the analysis should account for time value of money, which complicates calculation. LTV should be discounted to net present value (NPV) for a true comparison to the initial customer acquisition outlay of capital. Embracing the steps above will improve analytical capability, empower founders, impress investors, and lead to more meaningful conversations. Not every business will require the above level of nuance, but it is helpful to review each step to verify that it’s been appropriately evaluated. These KPIs should be included in almost every business plan, and VCs will expect to see forecasts and analysis on the topic. What is LTV and CAC? LTV stands for lifetime value and is a measure of the profitability of a customer for your business. CAC stands for customer acquisition cost and measures the cost of attracting a new client. How do you calculate LTV? LTV is calculated by subtracting direct expenses from LTR (often taking LTR and multiplying by gross margin). LTR stands for lifetime revenue and is calculated by multiplying average customer lifetime by average customer revenue. CAC is derived by summing sales and marketing expenses and dividing them by the new users added during the period. CAC can take different forms depending on the specificities of a business. 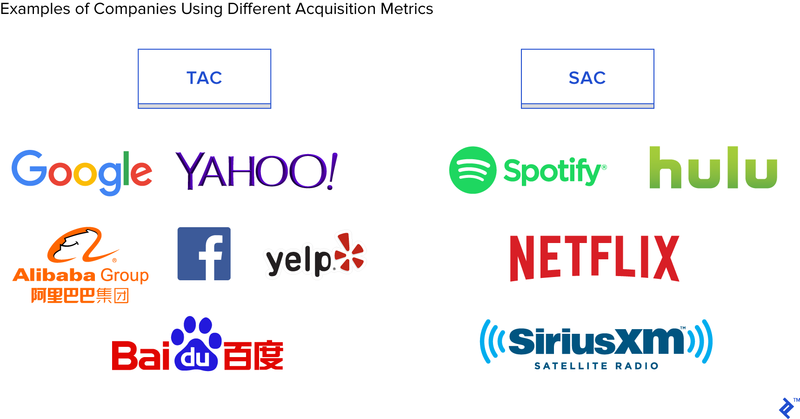 Websites often measure traffic acquisition cost (TAC), while companies like Netflix track subscriber acquisition cost (SAC). What is a good CAC ratio? A commonly used target LTV:CAC ratio is 3:1. If the ratio is higher than 3:1, then more marketing spend could be incurred. If the ratio is lower, then the company is paying too much for each customer and may struggle to become profitable. What is the definition of customer acquisition? Customer acquisition means the cost incurred by a business to attract a new client. In other words, it refers to the costs of marketing associated with the acquisition of a new client. Customer acquisition is commonly referred to as CAC. What is a good LTV to have? Rather than targeting a particular LTV, companies should target LTVs that are roughly three times higher than their customer acquisition costs (CAC). The target LTV is thus in relation to the cost of acquiring a customer. Previous articlewebdriver – How to control CEF3 portions of .NET project using Webdriver2? Should integration tests redo unit tests that use mocking?